To assess the performance of VOSA we have made a comparison with the Elodie library (v3.1). For the comparison we have selected only those Elodie targets with a quality flag=4 ("excellent") in effective temperatures. Then, for these targets, the observational SED has been built using photometry (Tycho, Stromgren and 2MASS) retrieved from VO services using VOSA. An average value of Teff(VOSA)-Teff(Elodie)=-34 ± 150K is found for a sample of 116 objects. An average value of Teff (VOSA)-Teff (Stroeer)=2800 ± 6700K is found for a sample of 14 objects. We compare the results in Yee et al. with the fit results obtained by VOSA. Library of optical spectra of 404 touchstone stars observed with Keck/HIRES. High-resolution (R~60000), high signal-to-noise (SNR~150/pixel). 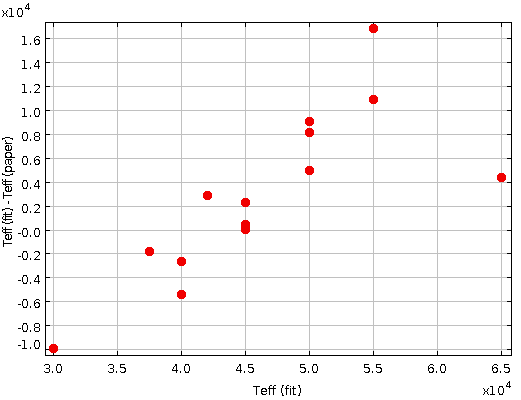 Properties (M, R, Teff, [Fe/H]) derived from interferometry, asteroseismology, LTE spectral synthesis, and spectrophotometry. Spectral types ~ M5-F1 (Teff ~ 3000-7000K, Rstar ~ 0.1-1.6 Rsun). Photometric SED built using Galex, Gaia, APASS, 2MASS and WISE data. Only objects with good fit (vgfb<=12) and sigma<200K in the Bayesian fitting are considered (155 objects). Only objects with good fit (vgfb<=12) and sigma<0.3dex in the Bayesian fitting are considered (38 objects). 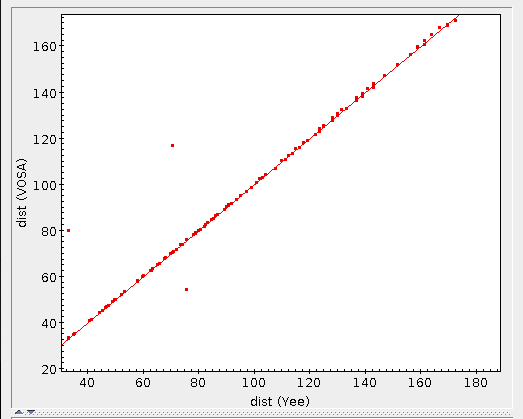 But if we use BT-Settl instead of Kurucz, the situation is the reverse, with the gravity values computed by VOSA systematically higher than those given in the paper (28 objects have been used this time). Only objects with good fit (vgfb<=12) and sigma<0.3dex in the Bayesian fitting are considered (141 objects). Only objects with good fit (vgfb<=12) and errors in Parallaxes (TGAS) < 10% (190 objects). Excellent agreement between the distances used in the paper and those used in VOSA (from TGAS). Similar plots are obtained if BT-Settl models are used instead. Excellent agreement for subsolar masses. Masses over 1Msun are overestimated in VOSA-BTSettl. We compare the results in Lindgren & Heiter 2017 (here-after LH17) with the fit results obtained with VOSA. Efective temperatures computed by VOSA are in agreement with those given in LH17. On average, LH17 temperatures are systematically higher by less than 100K both for BT-Settl and CIFITS. Standard deviations are below 150 K in both cases. Below 3400 K, LH17 effective temperatures are larger (250 K and 450 K) than those provided by BT-Settl. This trend does not appear if CIFITS models are used. Anyway, a larger number of objects would be neces- sary to confirm this result. As expected from the minor contribution of these parameters to the SED shape, the values obtained from VOSA are affected by large uncertainties and, thus, are not reliable. There are not significant differences between the radii derived using BT-Settl or BT-Settl CIFIST models and both are in very good agreement with the values derived by LH17. While masses directly derived from M = gR 2 /G are not reliable due to the large uncertainties associated to the surface gravities estimated with VOSA, those obtained using the BT-Settl and BHAC isochrones are in reasonable agreement with the ones obtained in LH17. The agreement is slightly worse if the BHAC isochrones are used. 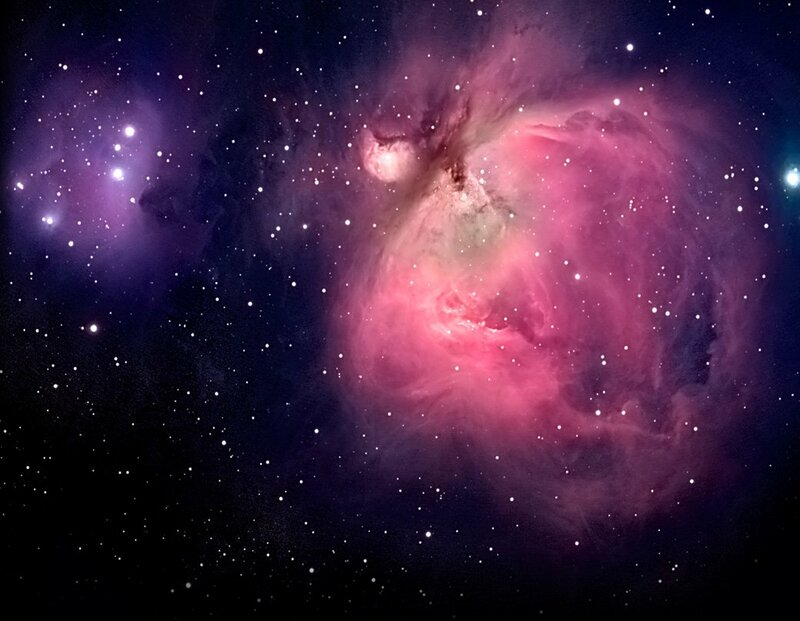 Photometric SED built using photometry from GALEX, Johnson, SDSS, TYCHO, APASS, GAIA, DENIS, 2MASS, WISE, AKARI and IRAS, retrieved from VO services. For comparison and to assess whether the parameters obtained with VOSA are model-dependent, we performed this analysis using two models: BT-Settl and BT-Settl CIFIST. One of the sixteen stars has not enough photometric data. Thus, this analysis was carried out for the fifteen remaining stars. Both models give consistent values for the effective temperature. Figure 1: Effective temperatures using BT-Settl. Correlation coefficient r = 0.95. Figure 2: Effective temperatures using BT-Settl CIFIST. Correlation coefficient r = 0.96. BT-Settl does not provide good results for the metallicities. Figure 3: Metallicities using BT-Settl. Correlation coefficient r = 0.41. Surface gravities provided by VOSA are not consistent with the values given in the paper. 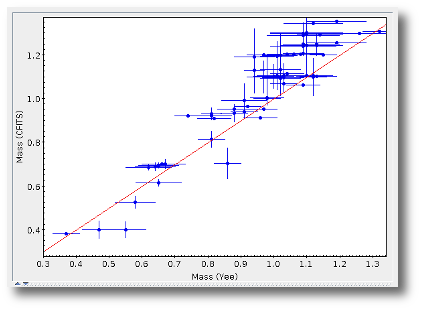 Using BT-Settl we obtain higher values for stars with the lowest gravities in LH17 and lower values for the stars with highest gravities (see Fig. 4). On the other hand, this does not happen using BT-Settl CIFIST but we obtain significantly higher values. Figure 4: Surface gravities using BT-Settl. Correlation coefficient r = -0.70. Figure 5: Surface gravities using BT-Settl CIFIST. 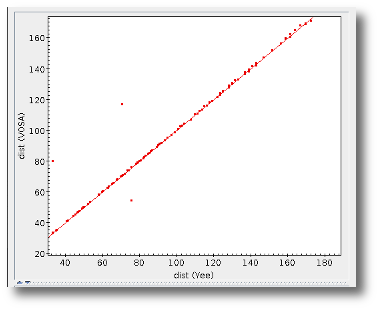 Correlation coefficient r = -0.11.
where M d is the proportionality factor used to fit the model to the observations, D is the distance and $\sigma$ is the Stephan-Boltzmann constant. Since the surface gravities provided by VOSA do not agree with those given in the paper, we do not expect consistent masses either. In any case, we performed for the masses the same analysis as for the radii and will derive proper masses from the HR diagram. There are not significant differences between the radii derived using BT- Settl or BT-Settl CIFIST models. Similar radii are obtained from Eqs. 1 and 2 and both are in very good agreement with the values derived by LH17. 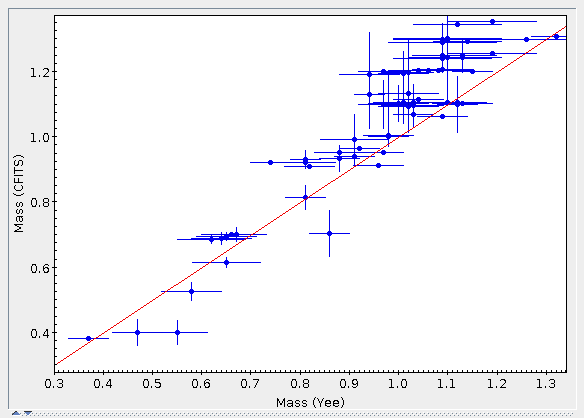 On the contrary, masses are not consistent with the masses expected for cool dwarfs and, hence, do not agree with those given in the paper, as expected from the log g values obtained with VOSA. Figure 6: Radii using BT-Settl. Correlation coefficient r = 0.97. Similar plots are obtained for the radii derived from Eq. 2. Figure 7: Masses using BT-Settl. Correlation coefficient r = 0.58. Similar plots are obtained for the masses derived from the radii calculated using Eq. 2. Figure 8: Radii using BT-Settl CIFIST. Correlation coefficient r = 0.97. Similar plots are obtained for the radii derived from Eq. 2. Figure 9: Masses using BT-Settl CIFIST. Correlation coefficient r = 0.65. Similar plots are obtained for the masses derived from the radii calculated using Eq. 2. Two K dwarfs lie outside the area covered by the isochrone. With a few exceptions, we found good agreement between values for the thirteen remaining dwarfs. In this case, only one K dwarf lies outside the area covered by the isochrone. The agreement with the masses in LH17 is worse using BHAC isochrones. Figure 10: Masses using BT-Settl isochrones. Correlation coefficient r = 0.93. Figure 11: Masses using BHAC isochrones. Correlation coefficient r = 0.85. We compare the effective temperatures and luminosities derived by Carlos Cifuentes San Román (Master thesis, Sept. 2017, Universidad Complutense de Madrid; hereafter CCSR), and the effective temperatures from Passeger et al. in prep. (hereafter Pass17) with the fit results obtained with VOSA. VOSA provides effective temperatures using BT-Settl models in agreement with the estimated values of CCSR within 200 K. The comparison with the effective temperatures computed by Pass17 results in a higher dispersion. This differences are explained by the differences among CCSR's and Pass17's temperatures (the relation between them gives a correlation coefficient of r=0.88). Excellent agreement between the bolometric luminosities provided by VOSA and CCSR's. Effective temperatures estimation for 48 M dwarfs from their spectral types and low-resolution model spectra. Luminosity determination for 48 M dwarfs given the magnitudes (u) B g V R r i J H K W1 W2 W3 W4 (u only used when available) performing numerical integration via Simpson's rule and Trapezoidal rule. Up to 16 photometric passbands in the range 154 to 22088 nm.W. Spectral types of the sample: M0 V -- M7.0 V.
2600 < Teff < 4100 K.
0.0007 < L < 0.1162 Lsun. 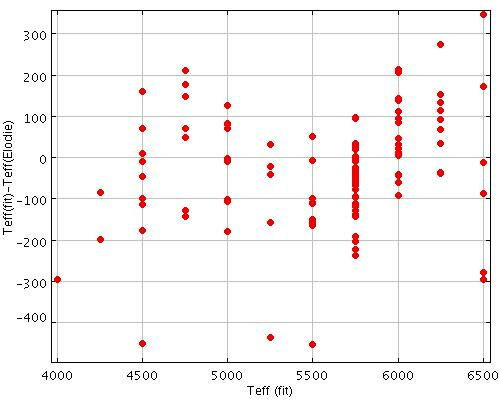 Effective temperatures for 30 M dwarfs of the previous sample derived using high-resolution spectra taken with FEROS at the 2.2 m of the European Southern Observatory (La Silla, Chile), CAFE and CARMENES at the 2.2 m and 3.5 m telescopes in Calar Alto (Almería, Spain), and HRS at the 9.2 m HET (Texas). 230 < Teff < 4169 K.
Photometric SED built using photometry from GALEX, Stromgren, Johnson, SDSS, TYCHO, APASS, Gaia, DENIS, 2MASS, UKIDSS, VISTA, WISE, MSX, IRC and IRAS retrieved from VO services. Of the 48 stars in this study, five have not enough photometric points retrieved by VOSA for the fit. To give an idea of the temperatures used for the analysis, the difference between them has a mean value of 58 K and a standard deviation of 111 K.
Effective temperatures provided by VOSA are in agreement with those derived by CCSR with one exception which effective temperature is 1000 K higher than estimated by CCSR. Fig. 1. Figure 1: Comparison of CCSR's effective temperatures. 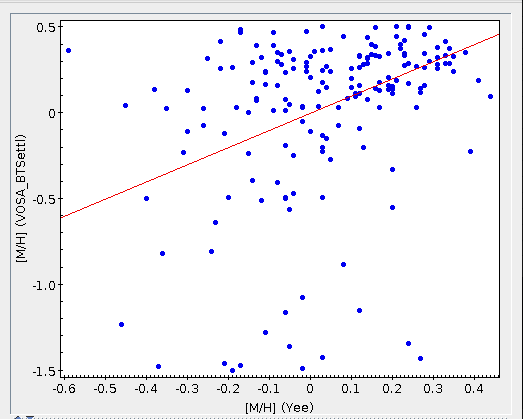 Correlation coefficient r=0.87 (r=0.93 excluding the one outlier). In this case, the concordance between temperatures is slightly worse, but also consistent. On average, VOSA provides higher values. Fig. 2. Figure 2: Comparison of Pass17's effective temperatures. 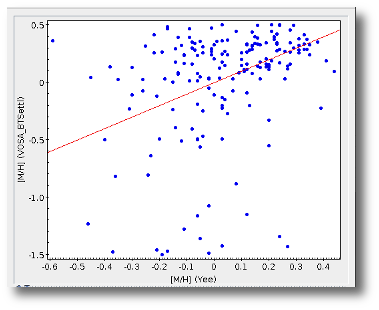 Correlation coefficient r=0.67 (r=0.84 excluding the one outlier). In CCSR, luminosities were derived from two different approaches: via Simpson's rule and Trapezoidal rule. The difference between them has a mean value of 0.00008 Lsun and, therefore, the comparison will be carried out using the luminosities obtained via Trapezoidal rule. The comparison with those obtained via Simpson's rule would be analogue. Mean(L (CCSR) - L(VOSA)) = -0.002 Lsun, std= 0.004Lsun. The estimated luminosities are in very good agreement. Fig. 3. Figure 3: Luminosities comparison. Correlation coefficient r=0.99. We compare the results in Rajpurohit et al. 2017, arXiv170806211R (hereafter Ra17) with the fit results obtained with VOSA. Efective temperatures computed by VOSA are in agreement with those given by Rajpurohit et al. (2017) in the studied range from 3000 to 4000 K, with some dispersion towards higher values between 3100 and 3300 K. On average, temperatures provided by VOSA are systematically lower by less than 100 K and standard deviations are below 150 K for both BT-Settl and CIFIST models. Metallicities and surface gravities provided by VOSA are not reliable due to the minor contribution of these parameters to the SED shape. -0.50 < [Fe/H] < +0.50 with errors between 0.03 and 0.11. 4 < logg [cm s2] < 5.5 with errors between 0.2 and 0.5. Photometric SED built using photometry from GALEX, Johnson, SDSS, APASS, Gaia, IPHAS, DENIS, UKIDSS, 2MASS, WISE and AKARI, retrieved from VO services. Model fit using BT-Settl (logg: 4 - 5.5, [Fe/H]: -0.5 - 0.5, Teff:3000 - 4000 K). Model fit using BT-Settl CIFIST (logg: 4 - 5.5, [M/H] = 0, Teff:3000-4000 K). We performed this analysis using BT-Settl models and used the more recent BT-Settl CIFIST models for comparison. Of the 45 M dwarfs of the analysis, only four had parallactic distances retrieved from VO services and another six had not enough photometric data for the fit. Both models provide quite similar values for the effective temperatures and are overall consistent within the errorbars with those given in Rajpurojit et al. (2017). Figure 1: Effective temperatures using BT-Settl. Correlation coefficient r=0.85. Figure 2: Effective temperatures using BT-Settl CIFIST. Correlation coefficient r=0.84. No good determination of the metallicities using VOSA. On average, metallicities obtained using BT-Settl models differ with the values given by Rajpurohit et al. (2017) by more than 7σ. Figure 3: Metallicities using BT-Settl. Correlation coefficient r=0.25. The surface gravities given by VOSA strongly differ with those given by Rajpurohit et al. (2017) for near half of the analyzed sample. Hence, these values are not trustworthy. Figure 4: Surface gravities using BT-Settl. Correlation coefficient r=-0.22. Figure 5: Surface gravities using BT-Settl CIFIST. Correlation coefficient r=-0.29.